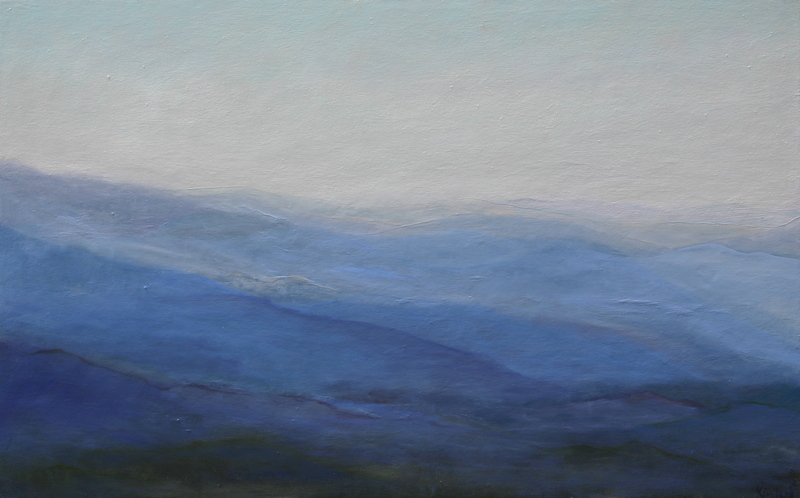 This painting, Aspen Vista View , oil on canvas , 30X48 is included in the Santa Fe Arts Commission exhibition, Common Ground. The Opening is Friday, August 26th 5-7 pm, City of Santa Fe Community Gallery, 201 West Marcy Street. The inspiration for this painting came from a recent trip up the road to the ski basin and a walk farther up to Aspen Vista. I am so drawn to these expansive views and Aspen Vista is one of the best in Santa Fe. Needless to say many years of living close to the ocean show up in this painting. It is fascinating to observe what bubbles up from the subconscious while I am painting. This is one of my favorite experiences of being an intuitive painter as opposed to an observational painter. Harmony shows up after many many layers of juicy oil paint. I hope you can join me for the opening. Congrats Jamie..this is an exceptional painting!! Absolutely beautiful! Nice exploration of this palette, Jamie. Beautiful painting Jamie. I’m a believer in letting things bubble up from inside. Memories, impulses and connections always come through when one doesn’t even realize it. Thank you Debora, Interesting process to observe isn’t it?